Jenny's London Ontario : What do we want for our riverfront? What do we want for our riverfront? The County of Middlesex has applied to redevelop the site of the Middlesex County Health Unit, possibly into a 30-storey highrise with 200 residential units and 4,500 sq. ft. of commercial space. The location at 50 King Street overlooks the Forks of the Thames and the Middlesex County building shown at right. Anyone opposed to the plan has been portrayed by the media, including the London Free Press, as an elitist NIMBY living in a Renaissance penthouse, disturbed by the thought of another tower ruining his view. The heritage perspective has been overlooked, not surprisingly. This is the historic heart of London. It was at about this spot in March 1793 that Lt.-Gov. Simcoe and his party first arrived at what he called New London. At the southwest corner of King and Ridout, Peter McGregor built his log shanty, becoming the first resident and tavernkeeper on the surveyed town plot. (The Peter McGregor tower is on that site today.) It was here that the London District Jail and Court House was completed in late December 1829. In altered form, the Middlesex County Building, or Old Courthouse as it's generally known, still stands today. 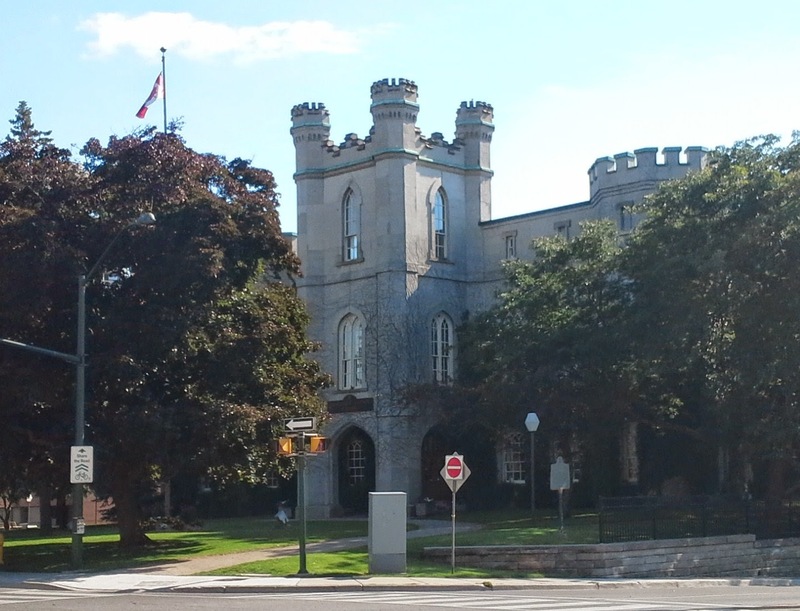 The castle-like Gothic appearance of the Old Courthouse was designed by Toronto architect John Ewart who also designed Osgoode Hall. It is believed to have been modelled after Malahide Castle in Ireland, birthplace of Col. Thomas Talbot. Situated on a hill overlooking the Thames, the Courthouse quickly became a landmark and gathering point, due to its central position in the rapidly developing settlement. The property was used for markets and fairs - and public hangings also drew large crowds from all over. In this building the Donnelly trials took place. Historically, it's the oldest and most important building in Middlesex County. Ridout Street was London's original north-south thoroughfare. Just to the north across Dundas is the Ridout or Labatt Restoration, a group of commercial buildings once known as "Banker's Row." North of that is Eldon House, the best remaining example of the riverside mansions built for wealthy Londoners, the city's first "suburbia." A modern highrise on the site of the health unit will dwarf the older buildings, making our heritage appear trivial and insignificant. The Thames may not be the Seine, Mississippi, or even the other Thames in the other London, but surely both the river and surrounding neighbourhood deserve more respect than this. What we need at the Forks are parks, gardens, restaurants, walkways, and historical plaques, not skyrises. Update, November 2015: Here it is. See what you think of the latest design for the proposed tower. The reporter says it's "sure to impress." Update, April 2017: Having overcome an OMB hurdle, this development is likely to happen, pending a transportation impact analysis.